In a jar, combine half the hot water with saffron and let it infuse for 10 minutes. In a tagine heat the oil and fry the onion, garlic, cumin and ginger for 2 minutes. Pour the saffron mix and the remaining water to the tagine. Add in the sweet potato and chickpeas. Cover with lid and simmer for about 15 minutes. Throw in the zucchini and simmer for another 3 minutes. Drizzle the honey and season with salt and pepper. For the quinoa, combine the quinoa, turmeric, cumin and water into a pan and bring it to a boil. Turn the heat low and simmer for 15 minutes. 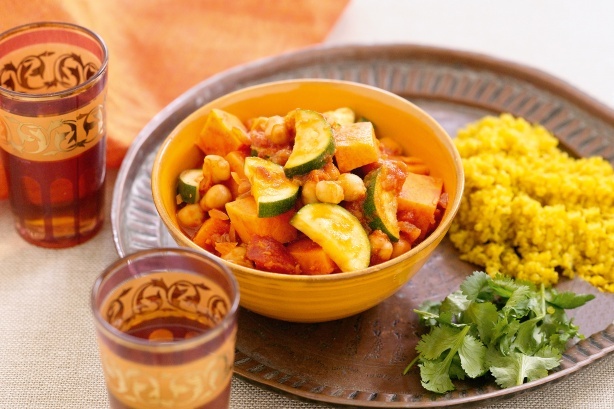 Serve the tagine hot with quinoa and coriander leaves.